One of the first factory shops in the country, started at a time when Nazeing Glass Works was making large numbers of wine glasses, sherry schooners, ashtrays and vases for restaurants and pubs around the country, the shop gave local residents the chance to buy locally made glassware at knock down prices. As the mix of products made by the factory changed over the years, so did the glassware on sale in the shop. 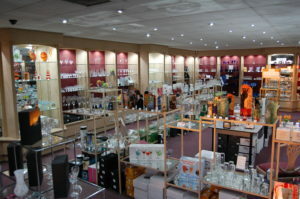 Nazeing-made glassware was also joined by other manufacturers’ ranges and a new shop was opened in the 1990’s with room for an even greater selection of glass from home and abroad including famous names such as Bohemia Crystal, Royal Brierley, Dartington Crystal – all at factory shop prices. Many items can be engraved for special occasions such as birthdays, anniversaries, weddings or retirements.